Two flags over Math Hall, one accompanied by Santa Claus. Parody Of: Columbia College Today. Parody By: Jester of Columbia. Title: “Columbia College Toady.” Date: April 1969. Format: 8.375″x11″ stapled magazine, 32 pp. + covers. Availability: Very scarce. 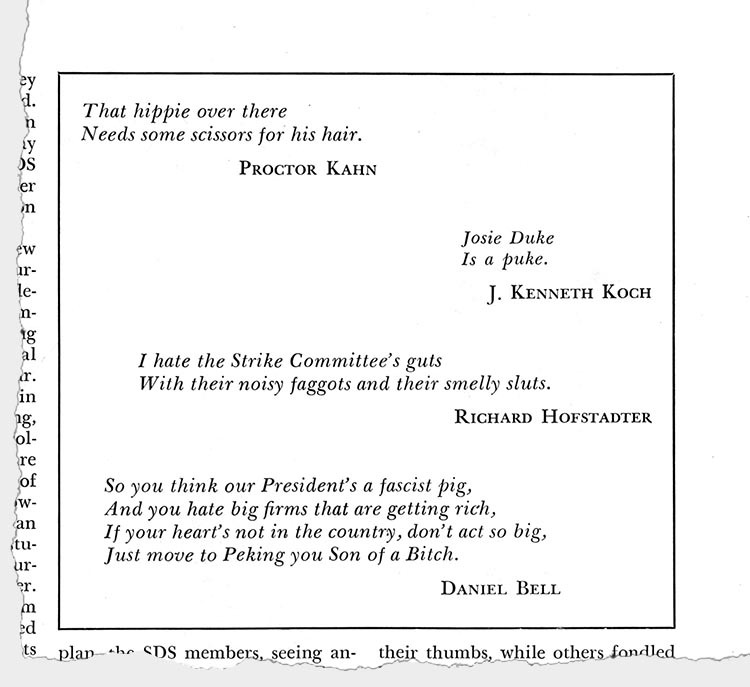 The Columbia Jester’s 1969 parody of the school’s alumni mag is no match for such classics as “Liff” (1948) and “Reader’s Dijest” (1949), but the wonder is it exists at all. 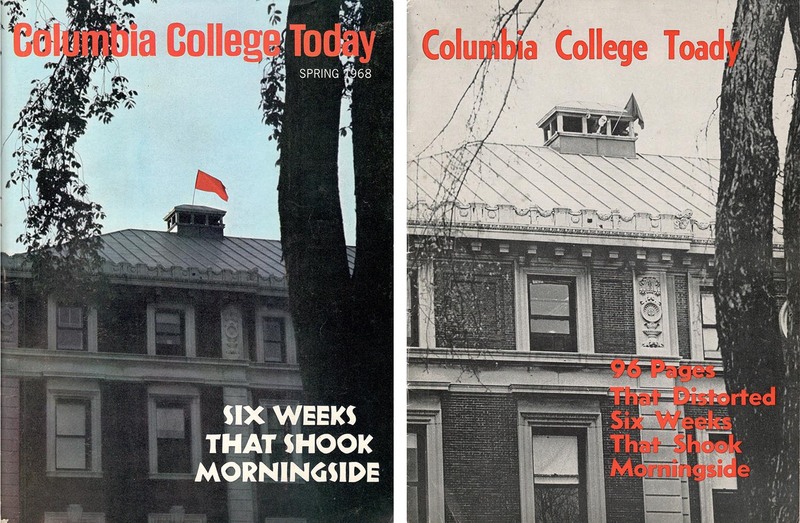 “Columbia College Toady” was Jester’s only issue of any kind between fall 1967 and April 1971. It was also the last major parody produced by a magazine not named Lampoon during the Golden Age of college humor, and one of the few to address the upheaval that helped bring that age to an end. 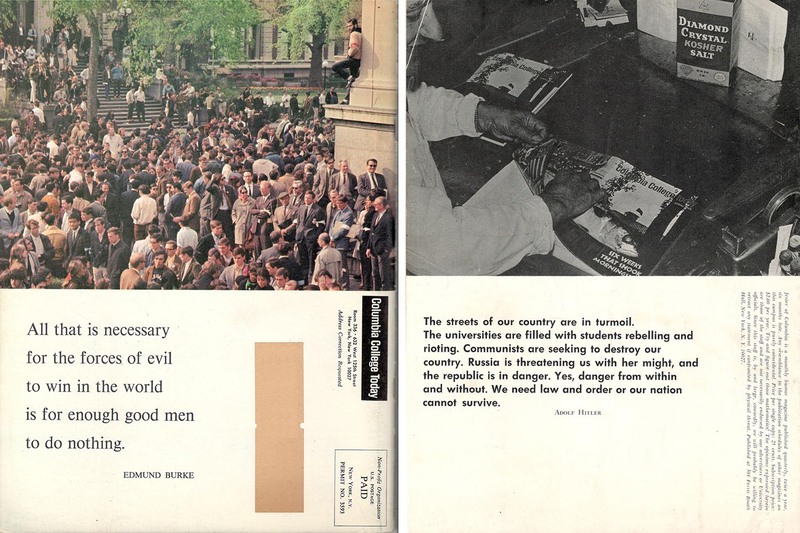 The spark for “Toady” was the real Columbia College Today’s coverage of the student uprising in the spring of 1968. What started as a protest against putting the school’s new gym in Harlem’s Morningside Park became national news when radicals led by Mark Rudd, head of Columbia’s chapter of Students for a Democratic Society (SDS), occupied five campus buildings on April 23rd, including president Grayson Kirk’s offices. For six days administrators dithered, then let police forcibly evict the protesters, which satisfied no one and led to classroom boycotts and a second, shorter occupation in May. The year ended with canceled exams, competing graduation ceremonies and bad feelings all around. 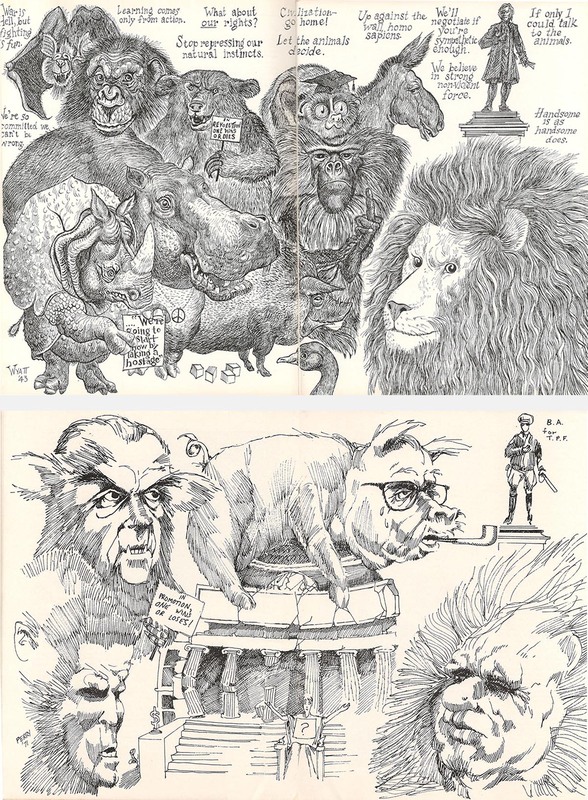 Stanley Wyatt’s zoo in CCT prompted Jester’s Lincoln Perry to make critters of provost David Truman, acting dean Henry Coleman, president Grayson Kirk and his successor Andrew Cordier. The report’s opening words, before and after Jesterization. Putting dirty words in the mouths of the Great and Good will never not be funny. Some of the problem was structural: When the report appeared, Jester editor Tom Kramer parceled it out in chucks to his “three or four” staffers for rewrites, then knitted their contributions together. The result is less a parody of Keller than a condensation peppered with jokes and insults; it sticks too close to events to admit the fantasy and nonsense that are college humor’s strengths. The best bits are the briefest: the photo captions, the obscene poems attributed to faculty luminaries, and the wheedling desperation of the fake Annual Fund appeal. “As I sat there, with CCT in one hand and ‘Toady’ in the other, I found it increasingly difficult to determine which one I was reading,” Rosen wrote. 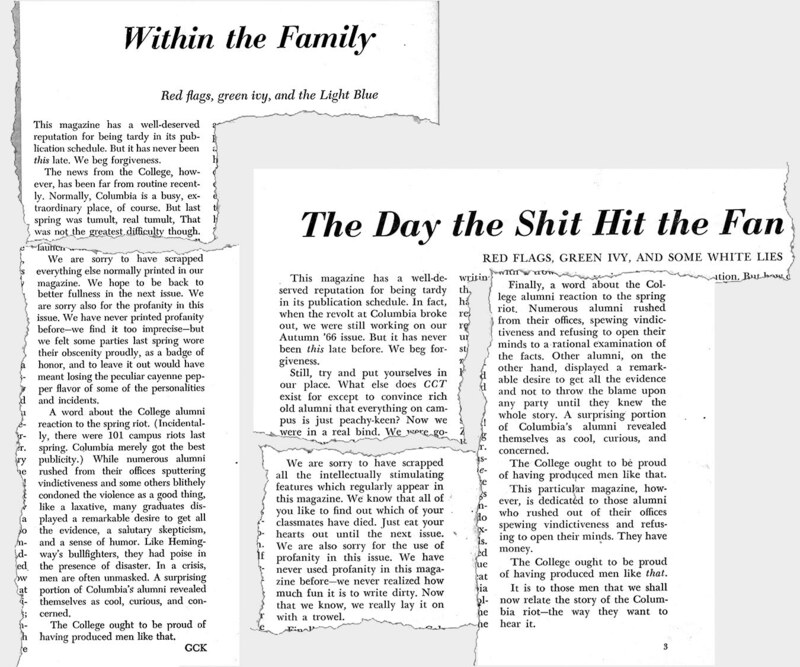 Both publications seem unhappy with the tasks they set themselves: Keller strains after objectivity despite identifying with one side of the conflict and being largely clueless about the other; the Jester crew spell out Keller’s implied disdain for The Kids and throw their own barbs at The Man, but often they seem on autopilot. Individual jokes land but don’t build, and the whole thing lacks exuberance. For all its rowdy disdain, “Toady” feels distant from the passions that had convulsed Columbia the previous spring. Their back pages: Famous quotes from Burke (real) and Hitler (spurious). 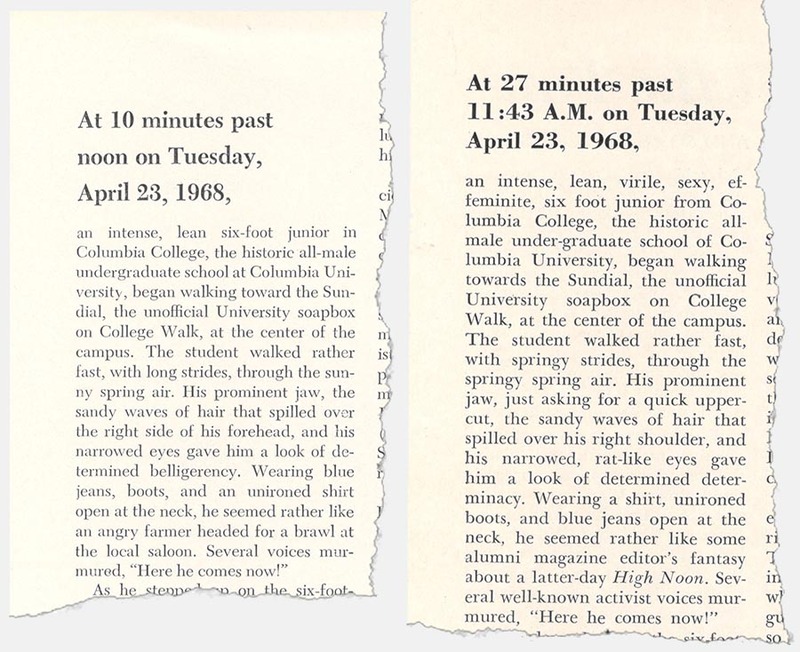 This entry was posted in College Parodies, College: 1946 on and tagged 1960s, College, Columbia College Today, Columbia Jester. Bookmark the permalink.